Create authentic smokehouse style barbecue in your own backyard with the GrillPro vertical cabinet smoker. The heavy duty welded cabinet features a secondary door that provides easy access to the smoker box and water pan and minimizes smoke and heat loss in main oven. The four chrome cooking grates are fully adjustable, providing ample room for smoking a variety of foods. Bring the classic art of barbecue into the future with the 30 inch Bluetooth Digital Electric Smoker from Dyna-Glo. Digitally set and monitor your cook time and temperature with your smart phone or tablet, using the smoker's Bluetooth connectivity. With the digitally-controlled, integrated meat thermometer, you can keep an eye on the food's internal temperature without opening the door, and relax knowing the smoker will turn off when the meat reaches your desired temperature. Designed for easy access and a simplified process, this smoker will have you serving up ribs, sausages and more in no time. Vertical Propane Cabinet Smoker Create authentic smokehouse style barbecue in your own backyard with the GrillPro vertical cabinet smoker. The heavy duty welded cabinet features a secondary door that provides easy access to the smoker box and water pan and minimizes smoke and heat loss in main oven. The four chrome cooking grates are fully adjustable, providing ample room for smoking a variety of foods. 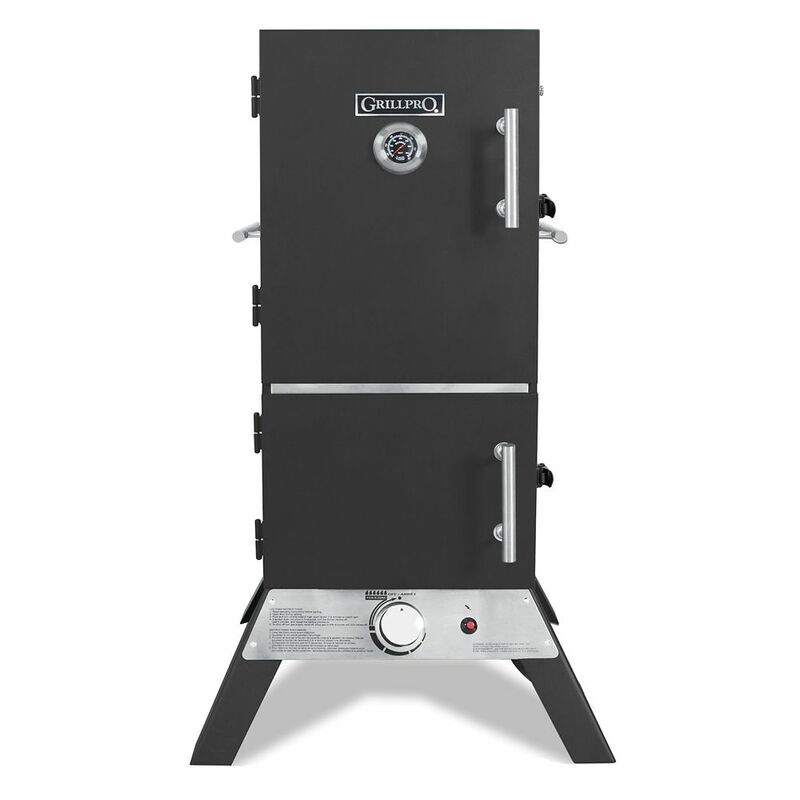 Vertical Propane Cabinet Smoker is rated 4.5 out of 5 by 2. Rated 4 out of 5 by Don from Packaged well, nothing bent or missing. I'm still learning how... Packaged well, nothing bent or missing. I'm still learning how to use it. Mine has a two settings on the control knob. Turn the knob to half open is turbo wide open. I use this to light it up. Keep turning it counterclockwise, and it goes into a "regular" flame. Anyway, this is what I use to smoke and it uses less propane. I'm still trying out the best combo for the wood and water position. I like putting one of the pans right above the burner, with the grate on that pan and the wood on top of the grate. Then the water pan above that. I Really like that the pans are wide enough to catch the drippings! I'm happy with it and look forward to many a brisket coming off of it. what is the maximum amount of racks that can be installed?